When the road turns to dirt, why should you have to turn around and go back? The brand new CUBE Nuroad bridges the gap between road and 'cross. It's a nimble, adaptable, go-anywhere bike that will take even the roughest of road surfaces in its stride. Tarmac, gravel, mud.... it's all good. 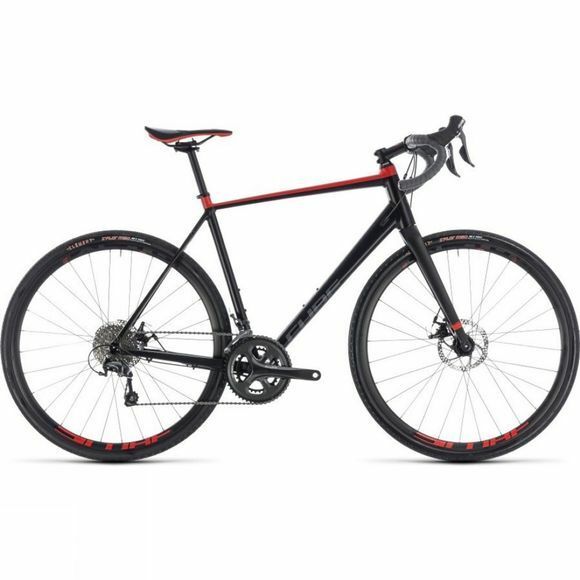 A new alumininum frame with carbon blade fork offers clearance to run up to 40mm width tyres - and with a reliable Shimano Tiagra 10 speed transmission and TRP Road Spire mechanical disc brakes, you've everything you need to ride to the edge of your world and beyond. Sometimes the simplest solutions are the best. Although we developed a completely new aluminium frame for the Nuroad, we made full use of our experience building great race and 'cross bikes. So, for example, the Nuroad's geometry is based on the comfort, stability and agility of our Attain series, but the sizing is the same as our Cross Race bikes. We made sure there's plenty of clearance to run wide, grippy and comfortable tyres up to 40mm width, and even left room for mudguards too. Internal cable routing keeps your gears shifting cleanly even when the mud and water's flying around, there's a replaceable gear hanger and the carbon fork blades help take some of the vibration out of rough surfaces, so that you stay comfortable even on long rides.